Back Story: In January of this year the UCI announced that all frames/forks and wheels used in UCI sanctioned races had to be approved. The initial approval process consisted of destructive testing after shipping multiple models to Switzerland and after a many thousands Swiss Franc fee. This was a pretty crazy idea for those of us who build frames with the same basic though much improved and perfected processes that go back a generation or three. Why and why now we asked? 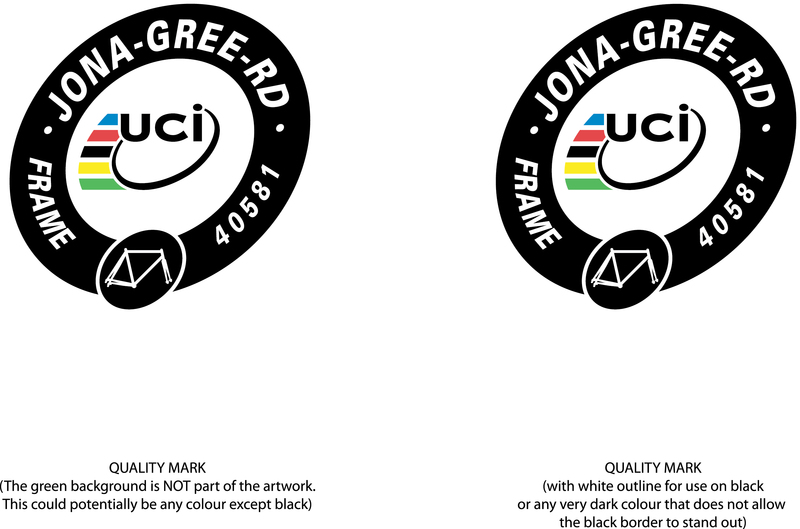 The UCI quickly came to the same conclusion and came up with a short form approval process that consists of sending the drawings for 3 sizes of frames within a range and extracting a modest pay to play fee. Once approved the UCI provides serial numbered art to have made into decals that are placed on each frame. No decal means no race. This international competition stuff usually would not matter to me, but I’ll have two-four bikes at the Cyclocross National Championships this winter in Madison Wisconsin and those races are sanctioned by the UCI as well as a handful of points races that my bikes will see. I had to pay to play. So now the good news. My new pal Technical Director Stephane Marracci with the Union Cycliste International approved the Jonathan Greene Road frames for International competition. It’s silly to say, but in short it means that one could race my frames in the Tour de France or Paris Roubaix or any other race I’ll only see from the side of the road. I can’t afford that outcome anymore than I could afford to have Andy Roddick use my Tennis Racquet or Tiger Woods my Golf Clubs, but my frame could in theory make the start line. My cyclocross frames have also been approved but I’m awaiting official notification. So yes, to answer your question Mrs. Jones, we are happy around here.